It’s been a while since we spotlighted some of the projects that members of our retro home blogger community have been working on — and the start of the new year is the perfect opportunity to check up on everyone’s activities. Today — we look at five retro house blogs’ recent projects. The first stop — Betty Crafter’s house — where she has just set up her new Heywood Wakefield king size dogbone bed, above, from heywood-wakefield.com. Although Betty was slightly concerned that the new bed wouldn’t match the rest of her vintage Heywood Wakefield bedroom furniture, she said that they coordinate quite well. Betty also says that the quality of the bed itself is great and that the company was easy to work with — helpful when they needed some direction while assembling the bed — which makes them very pleased with the whole experience. Yahoo for Betty’s new bed and for great customer service and quality heritage brands made in the USA. Laura of Little Mid Century House on the Prairie owns the adorable ranch above (though in Canada, ranch houses seem to be called bungalows.) 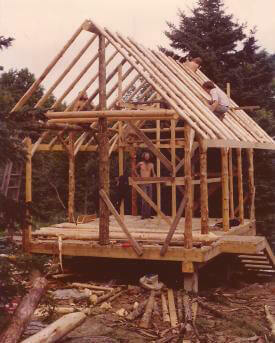 She works in historic preservation and was interviewed on CBC Canada about midcentury houses. It is a very interesting interview — only six minutes long — and definitely worth a listen. 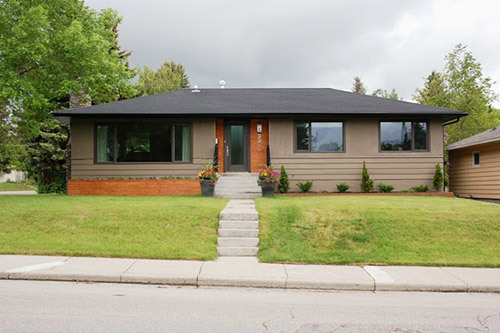 Seems our neighbors to the north are having the same issues as we are here in the States: people tearing down or removing these midcentury modest ranch homes to build much larger houses. We’re glad to know we have an ally in our fight for the mid century modest way of life up in Canada — go, Laura! 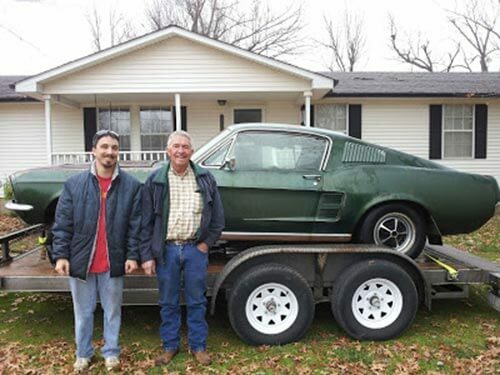 Michael of Cul-de-Sac Shack and his father are starting a father-and-son project — to whip a 1967 Mustang Fastback back into shape after its 30-year snooze in a farm pasture. Michael says it needs pretty much everything except the body, which is in good shape. Sounds like quite a project but it will provide you with hours of quality time together. Good luck. The multitalented Tasha at by gum by golly — who constantly amazes me with her sewing skills — shares her secret to a proper vintage roll back using a scarf. Tasha you are the epitome of vintage style — maybe with some luck and your tutorial, I’ll be able to style my hair for videos on Retro Renovation TV. A special thanks to all the retro bloggers that we’ve featured today for allowing us to show their photos here — and for being a part of our retro online community by filling it with their know how, vintage finds and projects. You rock. Do you have an active retro house blog? Is it on our list? If not, leave a comment and let us know about it, so we can keep up with your projects — and maybe feature you here, too! After a few people asking for more pictures and more stuff on my mini martini that Pam and Kate so awesomely featured on their Design Dilemma segment last week, I created a blog for my house. I’m writing post after post in my free time bringing it up to date, but there’s a lot of progress to document from the past few years. In any case, here it is: http://minimartinihouse.wordpress.com/ Thanks! I noticed right away you latched onto the “mini martini” nomenclature. Way to own it!